Tallow Fatty Acids Market size was more than USD 2.5 billion in 2016 and is estimated to witness growth more than 2.5% over the projected timespan. Increasing soaps and detergents demand across the globe will be the major factor propelling the global tallow fatty acids market size over the forecast timespan. 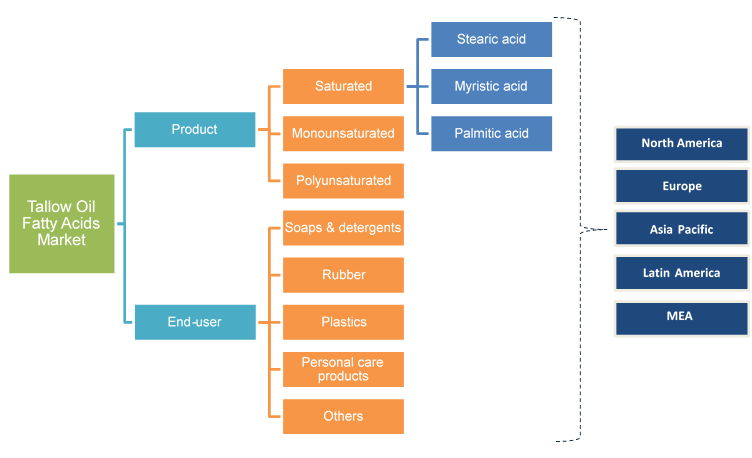 The product (stearic acid, palmitic acid and oleic acid) are majorly used in manufacturing soaps and detergents, thus elevating soaps and detergent business will subsequently boost the overall industry size by 2024. For instance, the product is majorly used in the soaps to provide creamy lather along with superior conditioning properties. In addition, the global cleaning product market revenue in 2013 was more than USD 60 billion and is projected to exceed USD 100 billion by 2024. 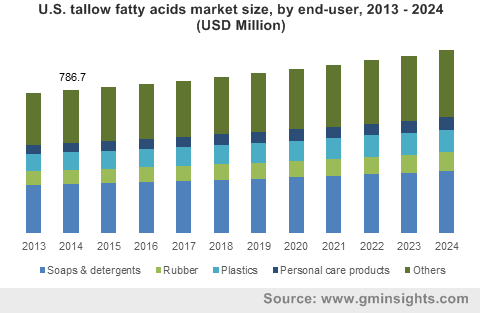 Furthermore, prevalence of favoring regulations regarding cleanliness and hygiene in the food & beverage and manufacturing industries will proliferate the global tallow fatty acids market size by 2024. Positive growth indicators in the rubber and plastics industry will stimulate the overall tallow fatty acids market share in the coming years. The product is widely used in the rubber and plastics industry on account of its ability to offer stabilizing, lubricating, gelling, and anti-caking characteristics. For instance, across rubber processing the product (stearic acid) is used anti-tacking and vulcanization agents and in plastics it is used as additives. Thus, escalating rubber and plastic demand from various end-user industries such as packaging, building & construction, automotive and electronics will drive the global tallow oil fatty acids market size in the near future. Drifting industry trends of manufacture soaps and detergents from vegetable oils over the product may hamper the global tallow oil market size over the forecast timeframe. For instance, the product faces stiff substitution threat from palm oil. In addition, palm oil production is comparatively low and is thus preferred in the business. However, rising product applications in industries such as food & beverage, pharmaceuticals and personal care will create new growth avenues for the overall tallow oil fatty acids market by 2024. For instance, the product is classified as GRAS (Generally Recognized As Safe) by the FDA for its use in food products such as candies. Saturated tallow fatty acids market size is forecast to exhibit gains more than 2% CAGR from 2017 to 2024. The product has long chains of carboxylic acid with 12 to 24 carbon atoms, which are saturated with hydrogen. It is majorly used in production of soaps & detergents, rubber & plastics, oilfield chemicals and pharmaceuticals. Thus, strong demand for these products will subsequently boost business growth. Monounsaturated tallow fatty acids market share led the global business in 2016. These are majorly use in used in manufacturing soaps and cosmetics. Increasing cosmetic demand on account of increasing consumer focus towards personal wellbeing will positively impact on the global monounsaturated tallow fatty acids market size in the coming years. The global tallow fatty acids market size for soaps and detergents was more than USD 500 million in 2016. The product owing to its high conditioning and moisturizing properties is mainly used in manufacturing soaps. Thus, robust growth in the cleaning and detergents industry on account of improving consumer lifestyle dynamics is analyzed to be the major factor propelling the industry size. Rubber applications is forecast to witness growth more than 2% over the forecast period. The product primarily used as stabilizing agents and are effective lubricants which reduce adhesion between unvulcanized rubber layers. It also helps in improving the rubber-metal adhesion, which is an essentially required in manufacturing tires. Increasing automobile manufacturing and sales will increasing product demand for tire manufacturing, which we subsequently drive the global tallow fatty acids market size by 2024. North America tallow fatty acids market size was more than USD 950 million in 2016. Prevalence of strict government regulations in order to maintain hygiene across food & beverage and medical industry will is a prime factor propelling industry growth in the region. Strong automotive manufacturing and sales is another factor pushing the regional industry for rubber applications. Furthermore, increasing plastic demand in the region due to prevalence of substantial end-user industries such as automotive, electronics, etc. will complement regional growth. Asia Pacific is forecast to experience prominent growth over the forecast timeframe. Positive growth indicators in the regional FMCG sector is the chief factor driving the overall industry growth in the region, as soaps and detergents are one of the important consumer goods. Escalating automotive manufacturing and sales in China, India, Japan and Indonesia is one amongst the major factor propelling the regional growth. In addition, prominent growth in the regional end-user businesses such as electronics and construction has substantially stimulated the overall rubber and plastic demand in the region, which in turn proliferates the tallow fatty acids market size in the region. Tallow fatty acids market share is highly fragmented with top product manufactures accounting less than 30% of the overall industry chunk in 2016. Prevalence of various small and medium scale product manufacturers makes the industry competitive. Key industry share contributors include BASF SE, AkzoNobel, Twin Rivers Technologies, VVF L.LC, Godrej Industries, Vantage Oleochemicals, Inc., FerroMac International, LG Household and Healthcare, Limited, Emery Oleochemicals, Chemol Company Inc., Colgate Palmolive, Baerlocher GmbH, Chemithon Enterprises, Acme-Hardesty Co. and H Foster & Co. Ltd.
Tallow fatty acids are oleochemicals which are derived from animal fats. Different animal fats types such as mutton tallow and beef tallow are used for product manufacturing. Rising soaps & detergents products demand will be the major factor driving the tallow fatty acids market size by 2024. Additionally, increasing use of the product in the rubber and plastics industry shall contribute towards business growth. However, drifting product manufacturers preferences from animal based raw materials to vegetable based may hamper industry growth over the projected timeframe.